I attended a worthwhile webinar session from QSR on using NVivo in the literature review process. These free webinars are offered at regular intervals and can be accessed online. I learned some new tricks and best practices for organizing projects and considered the ways in which NVivo might enhance the literature review process. Find out how NVivo supports you in writing robust literature reviews. With NVivo, you can import journal articles, tag (code) sources for major themes in the literature and share data with popular reference management software. This live webinar will share importing your articles, organizing notes for easy retrieval, tagging or coding your materials to identify key concepts and creating visuals to see connections in your literature themes. 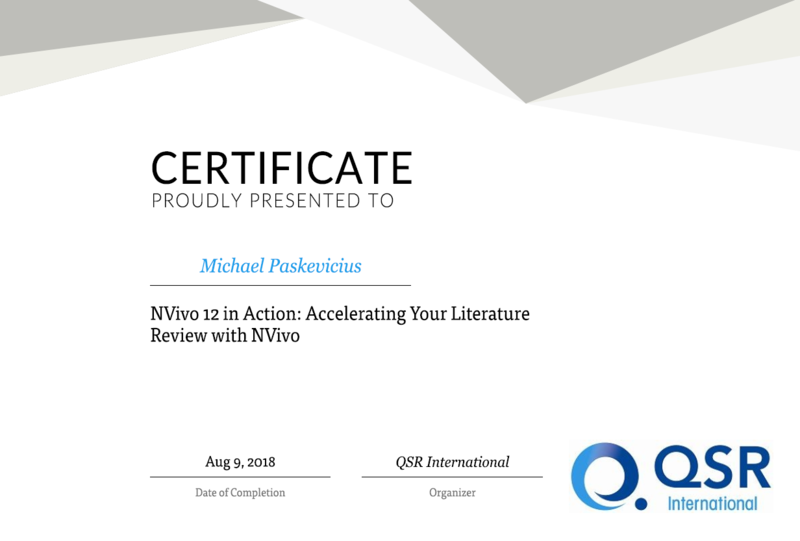 NVivo 12 in Action: Accelerating your Literature Review by Michael Paskevicius is licensed under a Creative Commons Attribution 4.0 International License.